← Speak To Your Rock! Why Moses Didn’t Enter into the Promise Land! 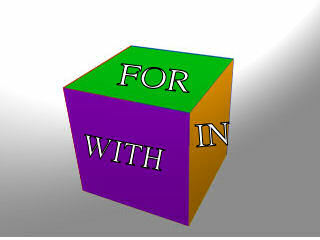 God In 3 Dimensions, God For Us, God With Us, God In Us! (ver 1.1) The Bible speaks of God in many different aspects with various described characteristics. The New Testament also states that we in the church today are now in a better covenant than the one that came before (Heb 8:6). What makes our covenant better now than the one that was established with the natural nation of Israel? I will not attempt to fully answer that question, but I will give you some pertinent clues to why I think it is better now. In the Old Testament God was certainly for the nation of Israel. God was certainly with the children of Israel. But, I do not think that God was ever in the children of Israel. God dwelt with the nation of Israel only in things that were built with the hands of men. Moses made God a temporary dwelling place using tents. Solomon built God a temple in Jerusalem. But, all of these things were just temporary patterns made by men for something that was to come that was made by God. Let’s examine the Bible today for God’s realities and why we have a basis of a better covenant now. God is the Lord of hosts and this verse establishes the idea that God was with the children of Israel in the Old Covenant. We can read stories in the Old Testament when Moses led the children of Israel out of Egypt, how God went before them in the day as a cloud and a fire by night. So we can clearly see how God was present with them during their time in the wilderness. We can clearly see that there are implied benefits for God being with us as this verse says that God was with Israel. This verse is speaking about the subject of spoken words and this verse implies that they can be weapons against us. But, elsewhere in the Bible God also said that no weapon formed against us will prosper, so we can see this is possible because God is with us. God is on our side, by our side and that is a very good thing. We have specific benefits, because God is with us. This verse in Matthew is a little different than the others. This time God is spoken of in terms of becoming a man like us and walking around with us on this planet. God in the flesh, walking around looking just like us. That is the powerful story of the salvation and redemptive plan of God. If God never came to be with us, we would all still be in dire straits. Let’s shift gears and look at the next dimension of God, God For Us! It is said that God is “for” us. This is contrasted as an antonym to the word to be “against”. I am certainly glad that God is not against us. However, I think that many religious people struggle with the concept of God not currently acting as the judge, the jury and the executioner. Whenever, 9/11 happened and terrorist flew planes into NY and Washington D.C., I heard many Christians try to say it was God’s judgment upon us. However, these are ignorant Christians who do not understand that God is “For” us and not “against” us. If God was “against” you and that was His judgment, no one would be alive to tell the tale. There is coming a day of judgment, but that is in the future. Right now Satan is responsible for all of the killing and murder going on in the world, not God! Satan is against you, God is for you. I could give you many more verses that speak to God being for us and not against us. But, I want to move on to the third dimension of God that makes our covenant much better than the Old Covenant God had with Israel. You see God was “with” Israel and “for” Israel, but never “in” Israel. We have this gift of God and it makes our covenant much better than the old. You see in this verse in Romans, God is saying that those who are born again, have the Spirit of God dwelling in them. God further stipulates that the Spirit of God is also called the Spirit of Christ. You cannot separate Christ from God nor God from Christ, they are one in the same. What is the difference between Old Testament prophets and New Testament Prophets? Both have a prophets anointing, but the New Testament prophet has God living on the inside of them and the Old Testament prophet did not. An anointing is like an outward pouring of the Spirit of God. The Spirit of God comes “Upon” a human and is anointed to do a specific job for God. David was anointed to be King by Samuel. The prophet poured the oil over the head of David and this was symbolic of how the Spirit of God came upon him. If David would have had the Spirit of God on the inside of him, David would have had to drink the oil. Little details like these are often times missed when casually reading the Bible. This is another verse in the same chapter of Romans, that declares that the Spirit of God dwells in the believer. This of course is very hard to describe to someone who doesn’t believe. I can tell them that I have sensed the presence of God within in me at times, in the past sometimes very strongly, like my insides were on fire. Other times I have felt nothing at all. But, regardless of the feeling or sensations that I perceived with my senses, I know He is there because His word says He is. He said He would never leave me nor forsake me, so I know He is there all the time. God can give you sensations that can be physically felt if He so desires and thinks that you would benefit from them. However, it is dangerous to pray and ask God to do this, because Satan can also manifest to deceive you. I never prayed or asked God to make me feel like I was on fire on the inside of my chest, God choose to do this because I guess He thought I needed it. Be very careful what you pray for, make sure it is based upon scriptures. I do not know of any verses that says God will give you any specific feeling in your flesh to confirm His presence. There are many verses like this one that I could include, but they just go to confirm the fact that the Spirit of Christ now dwells in those that believe. This is truly a mystery to the world and to the natural Jews. They have never experienced this, but they do have the opportunity to participate in this great mystery if they choose to. The free gift of life and salvation is open to whomsoever will. What does it mean to have God dwell in us? To dwell somewhere implies a place or a location that we live. Say a specific address or a specific city. I dwell in Dallas, TX, some might be able to say. A dwelling also implies a home. God has made his home in us. We are now the new home of God. Where we were not His home we have become His home. This is really an awesome difference between the New Covenant and the Old Covenant. The church is the New Jerusalem, the spiritual city of God’s new home. We have become this spiritual city built up in Christ, Jesus Christ the chief cornerstone, where in we all fit together being built up in the spiritual realm. So God is For You! God is With You! and God is In You! if you are a believer and have made Jesus your Lord and Savior. Posted on April 27, 2010, in Bible Study, Covenants, Understanding and tagged Bible, Christianity, Church, Covenants, God, Holy Spirit, Interpretation, Jesus, Prophecy, Religion, Revelation, Satan, Truth, understanding. Bookmark the permalink. 1 Comment.